Energetic ions and electrons accelerated during solar flares and coronal mass ejections constitute a significant component in eruption energetics and phenomena. When propagating away from the Sun in the interplanetary medium, to be observed near the Earth, the charged particles scatter due to magnetic field turbulence. In order to use particle observations to understand how the particle acceleration and release are related to eruption characteristics at the Sun, we must also understand the effects of interplanetary particle transport in the turbulent field. Recent observations of solar energetic particle events at large longitudinal separation, as shown in Figure 1, reveal that the particles can be detected over a very wide longitudinal range . This presents a challenge to current theoretical models of particle transport, in particular for particle propagation across the mean interplanetary magnetic field. STB, “ahead” and “behind”) observing energetic particles from a solar eruption (the feature extending from the solar surface). The spiral curves depict the mean interplanetary magnetic field lines. On the right we show the Stereo energetic particle observations of a back-side solar event on Jan 17 2010. Typically, studies of solar energetic particles use a very idealised description of the interplanetary magnetic field through which the particles propagate. In this nugget we investigate how a moreT realistic model of the field, which includes structured, nonlinearly evolving turbulence, affects energetic particle transport. We investigate particle propagation in this field, and compare our results on cross-field propagation to those obtained from an idealised field description. To describe the field, we have introduce the concept of turbulent envelopes . Idealised descriptions of the interplanetary turbulence usually assume uniform, homogeneous magnetic turbulence, overlaid on a constant background magnetic field. In reality, solar wind turbulence is evolving non-linearly and is permeated by transient structures . In our model of ‘enveloped turbulence’, the field perturbations are structured, with varying amplitude in the direction along the magnetic field. The composition of the turbulence is allowed to vary from one envelope to another, mimicking non-linear evolution. Figure 2: The turbulence envelopes are of cosine shape (the colour-filled curves), giving the turbulence large-scale structure. In the modulated amplitude model, the spatial variation of the total amplitude is given by the thick solid curve, representing the sum of the envelope amplitudes. 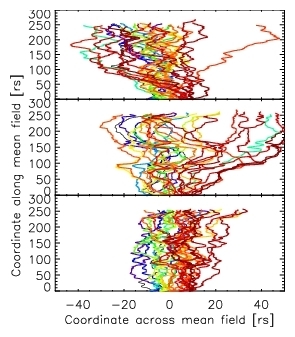 The turbulence is enveloped into cosine-shape envelopes, which introduces spatial variation in the amplitude of the turbulence in the mean field direction, characterised by envelope length Lp and density ρp (Figure 2). In this description, the homogeneous turbulence model would be described by infinite values of these parameters, and a spatially constant total amplitude (thick solid curve in Figure 2). The turbulent envelopes contain a sum of Fourier modes that form a Kolmogorov wavenumber spectrum (see  and  for details). Figure 3: Turbulent magnetic fieldlines in homogeneous (top panel), modulated amplitude (middle panel) and random envelope (bottom panel) turbulence models. The phase of the waves can also be varied between envelopes, and we consider two models for this. In the modulated wavefield model, the phases of the waves are coherent throughout the simulation space, and thus the amplitude of the turbulence is only modulated by the sum of the envelopes (the thick black curves in Figure 2). In the random envelope model, we break the coherence by randomising phases and wave vector directions in the different envelopes. 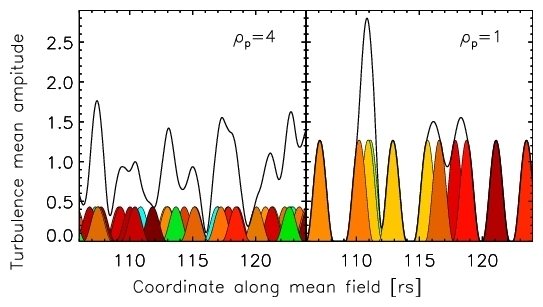 In Figure 3, we plot magnetic field lines to show how the enveloping affects the spreading of the field. The modulated amplitude model (middle panel) does not differ qualitatively from the homogeneous model (top panel). In the random envelope model (bottom panel), the field lines have a considerably smaller spread. This is caused by the loss of coherence of the 2D wave modes, which have their wave vectors perpendicular to the mean magnetic field . where Δζ² is the square of the particle displacement in direction ζ at time t, z is the direction of the mean magnetic field, and the <> denotes ensemble average over the simulated particles. Our results are also compared to those obtained using the homogeneous model. We set the mean magnetic energy density over a large spatial range to be the same in all cases. Figure 4: Perpendicular diffusion coefficient in the different turbulence models for 10 MeV protons, as a function of the enveloping parameters. The black curve represents the homogeneous turbulence result. The coloured curves in the top panel show the modulated wavefield result, and in the bottom panel the random envelope result. Lc is the turbulence correlation length [3,4]. Here we will concentrate on the effect of the structures on the perpendicular diffusion coefficient (the effect on parallel diffusion coefficient is discussed in ). In Figure 4 we show the perpendicular diffusion coefficient for different turbulence models and parameters, for a 10 MeV proton, in strong turbulence. As can be seen, the presence of structure decreases the perpendicular diffusion coefficient, reducing the perpendicular diffusion by up to an order of magnitude. In particular, the loss of coherence in the random envelope model has a significant effect, and is most pronounced for short envelopes (small Lp). 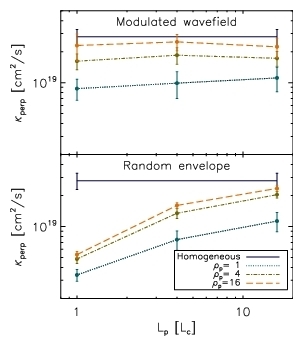 Strong overlap of the envelopes, characterised by larger ρp, results in a less pronounced effect, as the turbulence approaches the homogeneous description, in particular with the modulated wavefield model. The characteristics of the interplanetary turbulence affect the energetic particle propagation parameters significantly. In this work, we have shown that the inclusion of structuring is very important and reduces the perpendicular diffusion coefficient by up to an order of magnitude. In particular, the effect is strong when, with the help of the spatially changing random wave phases, we break the large-scale coherence of the waves. Our work demonstrates that treatments which ignore the presence of structure and non-linear evolution of the field can significantly overestimate the perpendicular diffusion coefficient. As a result, structuring of the turbulence does not provide an explanation for the observed widely-separated particle events, and perhaps we must look to other properties of the interplanetary magnetic field and turbulence. The work is described in detail in .